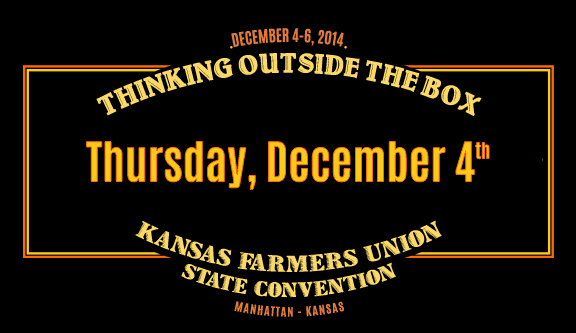 Join the Kansas Farmers Union Board of Directors and National Farmers Union Historian Tom Giessel for lunch and some early NFU history while learning how it developed into a modern-day ag organization. The board holds its quarterly meeting and reviews proposed bylaw changes prior to the General Session. During the General Session, members nominate board candidates and national convention delegates, receive a report on organization finances, and begin drafting 2015 KFU Policy. Evening activities include a visit to the Flint Hills Discovery Center, a dutch-treat dinner, as well as a presentation on early KFU history by Giessel. NFU honorary historian Tom Giessel will share his historical knowledge and findings on the early years of the Farmers Educational Cooperative Union of America, which grew out of the old Farmers’ Alliance organization. Giessel will speak on the original organizers and their history, how they organized Farmers Union locals and carefully structured the organization politically, how Farmers Union geographically spread across the nation, and how it developed into a modern-day organization. Giessel will also discuss the role of newspapers and newspaper editors in those early years, plus the importance of Cooperation, Legislation, and Education to the the membership. Consideration and adoption of policy and bylaws concludes. Tour of the Flint Hills Discovery Center, a unique museum that explores the geology, biology and cultural history of the Flint Hills. NFU honorary historian Tom Giessel will discuss the early years of KFU, and the major role cooperative education played during that time. Since KFU is meeting in Manhattan, the home of the first land grant college in the nation, Giessel will also discuss the relationship Farmers Union had with agricultural colleges, the legislation regarding agricultural education, and the equal importance of scientific farming taught by the college and marketing skills and knowledge provided by the organization.